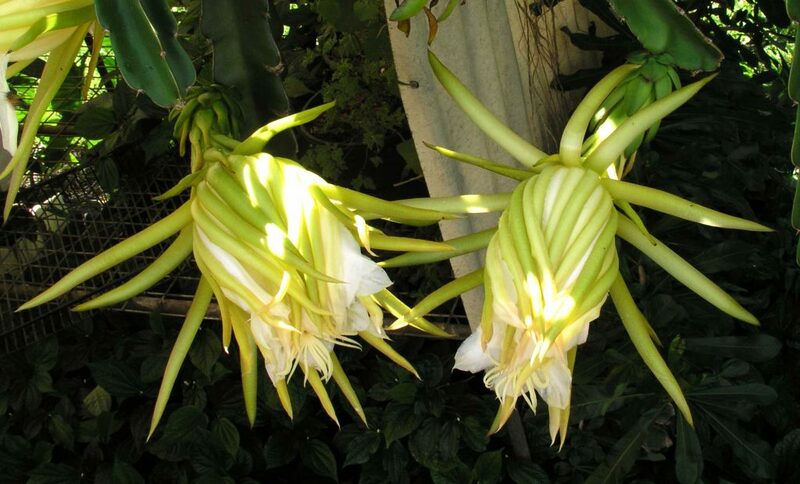 Perennial, climbing cactus with triangular fleshy stems, that can grow 1-3 metres high or more and develop many side branches. On the edges of the stems, fine spines 3mm long, form in clusters of 3-6 at 1-2cm intervals. Sweet scented flowers with waxy, white petals form like elongated cups to 15cm long, brimming with gold stamens; blooming at night. Oval to oblong fruit with overlapping scales fill out quickly, and about 40 days after flowering the fruit (8-15cm long) ripens, ready for picking. The colour of the fruit will depend on the species. 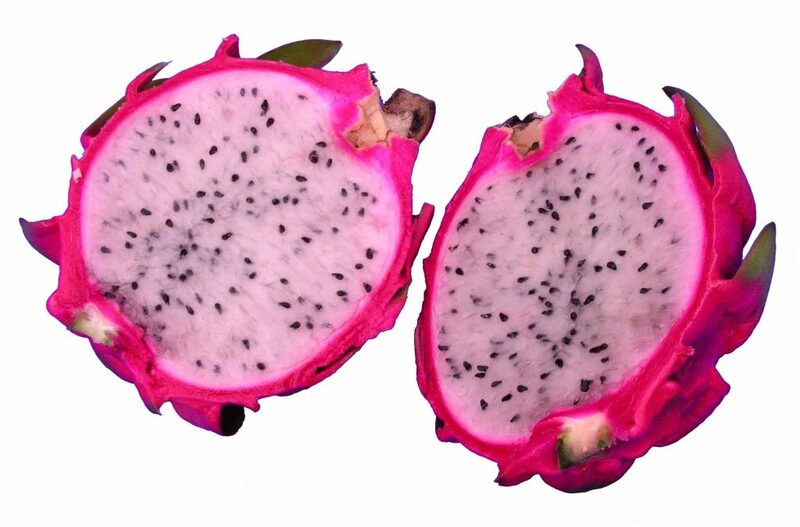 Hylocereus polyrhizus has bright red skin and flesh, dotted with small edible black seeds; H. megalanthus a yellow skin and white flesh; H. undatus a bright-pink fruit and white flesh. Bees and other insects visit the flowers before dusk as the petals unfold. If insects do not seem to be working the flowers, hand pollinating may be necessary. Cross pollinating by hand of different species can encourage more prolific fruit set, and fruit may be larger in size. 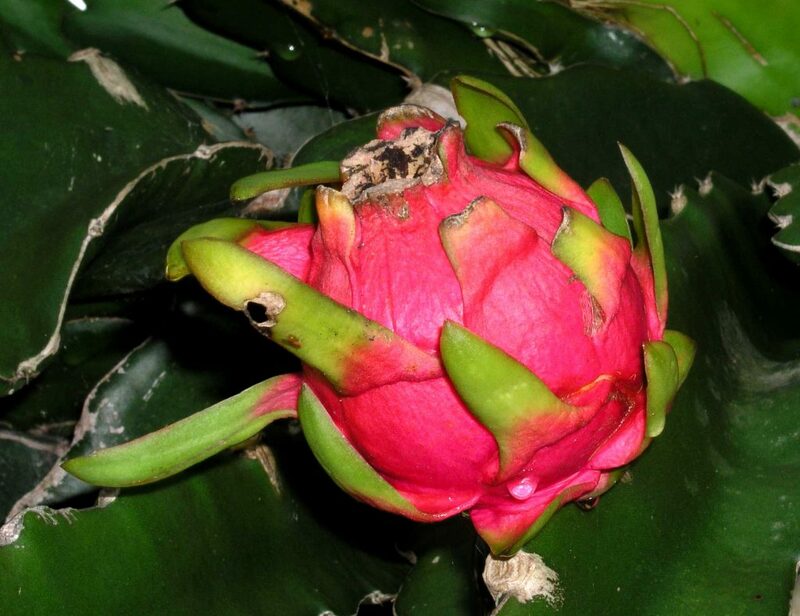 It is said, that it is an advantage for pollination to have the red fruiting species (H. polyrhizus) planted in the vacinity of the pink fruiting variety (H. undatus). Often, fruit may not set in the first year of flowering. When seen in supermarkets, the bright coloured skin of the fruit almost glows and says ‘pick me up and try’. Do be enticed by the eye catching fruit, or grow some in the garden for the potential fruit, often called the ‘gourmet’s delight’. Ripe fruit are cut in half, length wise, and the firm crisp flesh scooped out with a teaspoon. Flavour is of a mild, delicate sweetness, and very refreshing. The flesh is used in fruit salads, set in jellies, mixed with milk, added to fruit juices, sherbets, frozen into iced delicacies and made into jams. Use the fruit to create spectacular centre pieces on a dinner table.